The Genelec 8040BWM is a professional two-way nearfield active studio monitor with a 6.5" woofer and a 3/4" tweeter. With a frequency response of 41Hz-25kHz and a 105dB max SPL, couples with dual 90Watt amplifiers, the 8040BWM is as powerful as it is precise and detailed. The Genelec 8040BWM is a professional two-way nearfield active studio monitor with a 6.5” woofer and a ¾” tweeter. With its small form factor and disproportionate power, the Genelec 8040BWM is a great option for small professional studios and home studios alike. With a frequency response of 41Hz – 25kHz, the Genelec 8040BWM not only provide a great level of detail in the higher frequency range but the low end also packs a serious punch! The inclusion of a rear-firing bass port ensures the reproduction of your bass frequencies is full bodied and powerful. This frequency response is also +/- 2dB so the Genelec 8040BWM provide a very true reproduction of the source material. 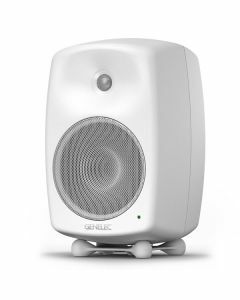 The Genelec 8040BWM features a 90Watt high frequency and 90Watt low frequency amplifier that power the tweeter and woofer respectively, giving a total system power of 180Watt. This dual amplifier setup means you can mix and record confidently knowing that both tweeter and woofer are performing independently of each other. The Genelec 8040BWM, a powerful studio monitor for professionals. The Genelec 8040BWM comes in the signature Genelec Minimum Diffraction Enclosure that features Directivity Control Waveguide (DCW) technology. The shape of the speaker is designed so that sound falls comfortably off the smooth edges of the enclosure and minimises phasing. At the rear of the speaker, there is a balanced XLR connection for signal input, as well as bass roll-off, bass tilt and treble tilt controls. With a max SPL of 105dB, the Genelec 8040BWM can output at an impressively high level making it ideal for playback as well as production. The Genelec 8040BWM is an ideal active monitor for editing suites, satellite studios and even small professional studios.